- My family, especially my parents. If I didn't have my Mom and Dad didn't help me out I wouldn't have been able to get my condo and for my Mom always getting me a pizza dough when she is at the bakery. - My last job. They allowed me to work Part-time so I could finish up my Bachelor's in Mathematics degree. It was the break I needed and I still let my previous bosses how grateful I am. - Having the chance to meet and remember my two great grandmothers. They were feisty women. One 100% Dominican and the other 100% Italian. I knew them until I was 8. - My memory. There are things I just can't and will not forget. - The ability to see outside the box. I struggle with it, but when it works, I'm ever so grateful. - My lil life. I'm grateful that I'm 27 years old with the whole world in front of me with all the chances the eye can see. - That I see the glass as half full. - That I had some teachers in my pretty much 19 years of schooling that cared about really teaching their students. Some of them were the best! - That my grandmother got to teach me how to play the piano. - I'm grateful that my family says "I love you" every time I see them or leave them. - All of you AWESOME READERS!! we need to do this with our daughter. i'm starting with, i'm grateful for my little home. thank you posting! What a great list. I need to do this everyday! it's important t be grateful in life. I a, also grateful for a lot of things in my life! I enjoyed this list too. I've been making a conscious effort to focus on gratitude this year and it is making a huge difference. I love your attitude. You do have a lot to be grateful for. que post tan bonito!! con esfuerzo se consigue todo! What an inspiring post! We must indeed be grateful for d good things in life. I know I've said this before, but I love that you physically write these lists out. it adds more meaning to them doesn't it? Awesome list. You do have so much to be grateful for. Keep 'em coming!!!! I love #1 on your list. Love is so important! When you have found it, hold on for dear life. 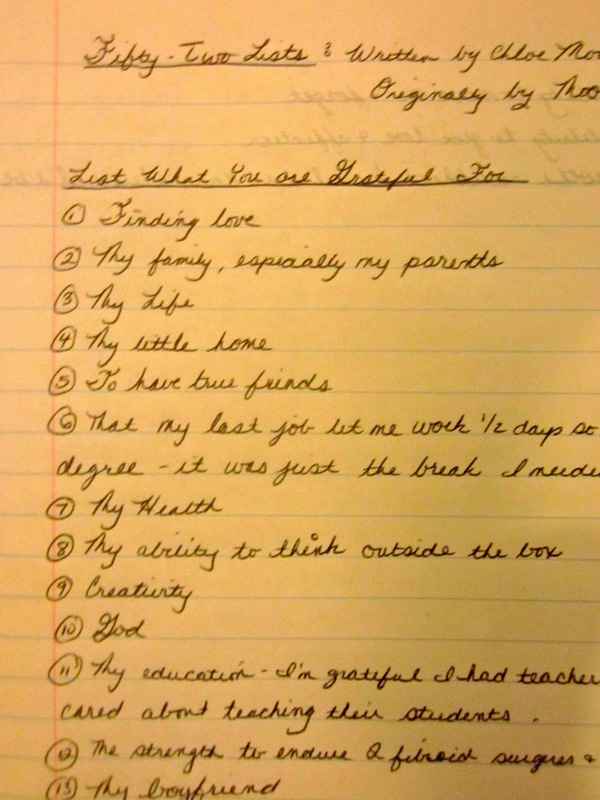 What a great list of things you are thankful for. I should make a list myself. This is a great list! 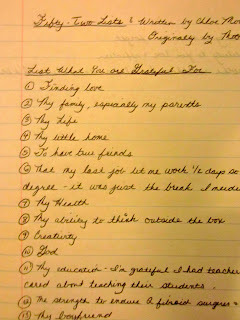 It's so important to reflect on what we're most thankful for in life - this was a good reminder for me to do so! I go through phases where I keep a gratitude journal (learned it from Oprah haha) and this reminds me that I should start it up again! I am really grateful that I live in Portland, OR because I absolutely LOVE this city! I am grateful for many things and I really think its soooo important to make a list like this to keep your spirit high, especially mid week! I am finishing off my list with a great big smile!!! I feel great after taking a few minutes to be grateful, THANKS! It is always nice to do such list. I will do that sometime soon.